"Joining Puppy School provided a neat structure for developing my skills as a trainer....."
Joy Matthews lives in Cheltenham and recently joined Puppy School after previously working in London. “I’ve been training dogs for a few years now but am fairly new to Puppy School – I started running puppy training classes with the Puppy School Franchise in in July 2016 and I currently run up to 2 classes per week. Puppy School fits in neatly around my other commitments as I run my classes in the evening. This means I can do a full day’s work and then head out to my training venue to help clients train their puppies – a perfect end to a busy day! I had been working as a dog/puppy trainer for a couple of years, in London. However, when we moved to our new base in Gloucestershire with my partner’s job, I wanted to ‘feel part of something’. I didn’t really have a network in my new area but joining Puppy School gave me just that and also provided a neat structure for developing my skills as a trainer. The Puppy School Facebook group has also been a rich source of information about new training techniques – in fact I’m on a new PS related course in a couple of weeks which looks at ‘creating canine calmness’. "It is great to be able to have total control over how much to work, when you work and to be able to choose times to run your classes....."
"I live in Norfolk, south of Norwich and teach Puppy School and Puppy University classes in Hethersett. I am also Regional Manager for Puppy School in Norfolk. I have been running classes since January 2015 and usually teach two classes per week on one evening. Sometimes it can be three or four classes over two evenings. I decided to train when my children both reached high school age and I felt I had more time on my hands. Puppy School fits really well around the school day as any administration and preparation can be done during the day between running the household and looking after the children and my own dogs. It is great to have total control over how much you choose to work, when you work, and to be able to choose times to run your classes that fit around your own family’s needs. I chose to become a Puppy School tutor because I was returning to work after being a stay at home mum for over 10 years. The support of Gwen as well as my Regional Manager and all the other tutors, gave me the confidence and network that I needed to get back to work doing something that I loved and felt passionate about. The best, best thing about being a Puppy School tutor is being able to help people who have very little confidence in their own abilities to train their puppies even though they love them dearly. It is fantastic to be able to show people kind, gentle effective methods to train their puppies and to see how happy it makes them to succeed where sometimes they never thought they could! Teaching puppy training classes and working with clients to train dogs at their homes can be a solitary career choice. Being part of the Puppy School network means that you will always have other dog professionals to support you, guide you, mentor you and even correct you if you go wrong. Belonging to a large body of professional people like this also means it is easy to keep informed and up to date with developments in the world of dog training." 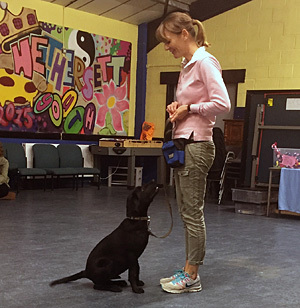 "The feedback I get from the classes is overwhelmingly positive, and it is lovely to see happy dogs around the local area who I have helped train from a puppy." 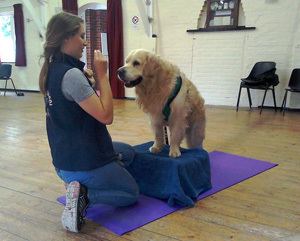 "I work as the Puppy School tutor for Colchester in Essex. I started classes in April 2013, and now run a minimum of two and up to four Puppy School classes every week. When I started classes, I was working part time in London after completing my studies in Animal Behaviour, and through building up my knowledge and experience now work full time as a behaviourist and trainer. Running the Puppy School classes was a fantastic decision for me, as it has given lots of training I wouldn’t otherwise have received, and has served as a great step into building a strong client base. I now run three other forms of classes, along with workshops and puppy parties at local vet practices, which stem from my Puppy School clients. The feedback I get from classes is overwhelmingly positive, and it is lovely to see happy dogs around the local area who I have helped train from a puppy. The set up of the classes is really flexible, so it would suit people in all different situations, and I have built up wonderful friendships with other Puppy School tutors through the courses and conferences. From a behaviour point of view, Puppy School provides the best training and up to date information about puppy behaviour and the behaviour courses run by Gwen are fab!"